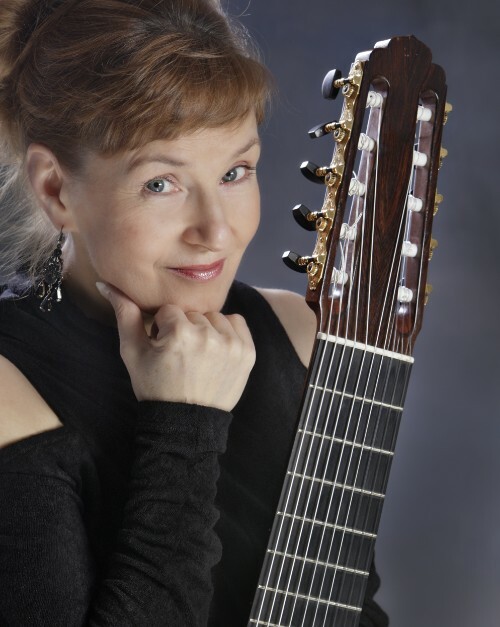 Ranked among the vanguard of the Finnish contemporary guitarists, Mari Mäntylä specialises in a rare type of classical guitar, namely the 10-string guitar or decacorde. She performs regularly both as a soloist and a chamber musician in different places in the world and she is engaged in collaboration with a number of composers from both Finland and abroad. Composers, among others, Jukka Tiensuu, Pekka Jalkanen, Juha T Koskinen, Olli Virtaperko, Sid Hille, Nikita Koshkin, Anastasia Salo, Graham Lynch, Vincent Bouchot and Tõnu Kõrvits. Mäntylä has given several premiere performances of new music composed for the decacorde and thus she has significantly contributed in making this instrument better known to the public. Her basic repertoire is drawn from different periods of classical art music, but she is a diverse musician, adapting easily to different music styles. Her work with Finnish folk musicians and her role as the guitarist in a band, specialized in Portuguese fado music are examples of this versatility. Mäntylä plays chamber music in a range of groups. Duo Dryades, a bandoneón-decacorde duo, formed together with the bandoneonist Kristina Kuusisto in 2002, performs actively at concerts in Finland and abroad. The duo has released three albums. All albums have received enthusiastic reviews in the press. Speira CD was selected a classical music Emma Award nominee (a prize issued by the Finnish recording industry for the most distinguished artists and productions of the year). Duo Dryades has also performed with the Ostrobothnian Chamber Orchestra in the concert where Pekka Jalkanen’s double concerto Aeterna, dedicated for this duo, was given its world premiere. One of Mäntylä’s music productions is monologue opera Dominus Krabbe, composed by Pekka Jalkanen, performed together with countertenor Teppo Lampela. The premiere of the Opera was given in the Helsinki Festival 2012 and after that it has been performed several times in different places in Finland. The first solo album of Mari Mäntylä, Decacorde (2008 Alba) received an excellent response in the music press both in Finland and abroad. She has appeared in several recordings and performed on the radio and television in Finland, Russia, France And Lithuania. Mari Mäntylä is the guitar and chamber music teacher of the Kuhmo Music School. She was also the artistic director of the Tirando Guitar Festival, organised in 2002 and 2003. Mäntylä studied the guitar at Tampere Conservatory with Jorma Salmela, in the department of solo studies at the Sibelius Academy with Jukka Savijoki, in Oscar Ghiglia’s concert class at the Basel Music Academy in Switzerland and at Accademia Musicale Chigiana in Siena, where she was granted a Diploma di Merito (an honorary diploma), in 1991. She took her soloist diploma at the Sibelius Academy in 1995 and Konzertreife diploma at the Basel Music Academy in 1997. She gained her Master of Music degree in 1998. Copyright © 2019 Mari Mäntylä.